Imo State Governor, Rochas Okorocha yesterday disclosed that South African President, Jacob Zuma, will from today pay a two-day visit to the state.Briefing journalists at Government House, Owerri, the state capital, Okorocha said Zuma, among other official engagements, would sign a Memorandum of Understanding (MoU) between Rochas Okorocha Foundation and Zuma Foundation. Also, the visitor would be expected to assess the planned over 20,000 hectare, Egbema Industrial Park estimated to cost over N2 billion and the Sam Mbakwe International Cargo Airport. 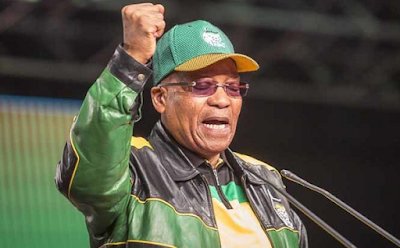 He said the pact would enable the duo work in partnership to move the interests of the humanitarian bodies together.“The South African President, Jacob Zuma will pay a two-day visit to Imo on Friday. We are working on a partnership at the Egbema Industrial Park, management of Imo International Cargo Airport and South African Airline. “My interest is to see that the airport takes off to help lift our exports, jointly work on education and sign an MoU between the Rochas Okorocha Foundation and Zuma Foundation,” Okorocha said.